It’s hard to imagine that an athlete could be 3rd, 3rd and 1st on the U.S. list over three years in a glamour event like the 400 and still be a pretty anonymous name on the national scene, but somehow that’s been the case with Miami Southridge junior Ebony Eutsey. 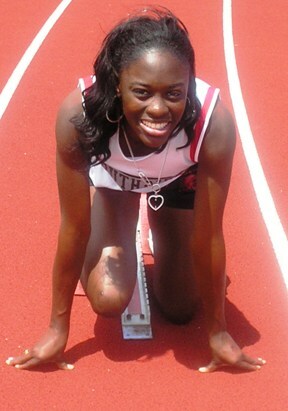 Her 52.67 as a freshman two years ago trailed only Ohio upperclassmen stars Jessica Beard and Meshawn Graham. Last year, her 53.23 was #3 after seniors Nadonnia Rodriques NY and Natalie Stewart UT. Well, if you hadn’t heard of Eutsey before this season, part of the reason was that she rarely competed outside of Florida. She did venture out and ran her PRs at USATF Youth Nationals and Golden West – big meets, but not as wide a scope as, say, USATF Juniors or Nike Outdoor. She’s also never competed in an indoor championship or a major invitational outside of Florida. Things are changing this year, however. For one, Eutsey’s 52.42 is far and away the national leader at this point (she has also run 23.84 for 200). Second, she has announced her intention to compete at both the Nike Outdoor Nationals and the USATF Youth Nationals, the latter meet having great significance this year as the Trials for the World Youth Championships. Yes, with three years at 53.23 or better, Eutsey is still “just” a Youth. While it’s still very early for most of the world, no Youths globally have run faster than the Floridian’s new PR. Soon it won’t be just Americans who will know about the “Eutsey Effect,” it will be fans of young tracksters throughout the world. After a region meet where she ran a sub-52 4x400 split and cruised to 200 and 400 victories, she slowed down enough for a few questions with DyeStat senior editor SteveU. 1) Ebony, you’ve had a great season to this point, especially the 52.42 400 you ran at U. of Miami. Can you tell us about that race and what it was that got you to that new peak? Do you feel like a lot of it was having Dominique Darden in the race to compete with? When you were done, did you have a sense you had set a new PR before you heard the time? I felt good and strong during the race. I ran with the intent to go 52 and that's what happened. Once the race was over, I knew I ran 52 because I was so close to first. 2) You’ve had three really great years in high school so far, but after not running quite as fast your soph year as your freshman year, now you’ve PR’d again as a junior. Do you feel like there’s some specific areas you’ve improved on in training and racing that has helped you to make this improvement? There are areas in which I've improved. For instance, my block start has gotten faster and my form is coming together well (specifically, lifting my knees when I’m running). 3) I understand you trained under Coach Sam Burley your first two years, and now that he’s retired, you are training under Coach Dja Dugue. Can you tell us what each coach has contributed to your success? How are they different? Are there any other coaches you’ve recently worked with in summer track, or has it pretty much been all coaches Burley and Dugue since you’ve been in high school? Both Coach Burley and Coach Dugue have helped me with school and staying focused on and off the track. My summer track coach, Toniann Fairclough, helped me get started during summer track when I was in the 3rd grade. 4) I’ve heard one of your biggest goals is to get Sanya Richards’ state 400 record of 52.51. Tell me about your motivation for that record. Do you also happen to be a fan of Sanya and have you ever met her? My motivation for breaking the record is my determination to accomplish my goal of running the best time I can run. My goal is 52 or 51 this year. I am a big fan of Sanya and Allyson Felix; however, I have not had the opportunity to meet either one of them. Winning Golden West 400 in 2008. 5) Two of your biggest post-season meets the past two years have been USATF Youth as a freshman and Golden West last year. Have you thought about what you want to shoot for this year? Are you interested in the Nike Outdoor Nationals? How important is it to you to qualify for the World Youth meet and have you thought about what it might be like to travel overseas and compete? This year I want to go to all of the national meets to be able to compete against the best and accomplish my goals I have set from the beginning of the year. Yes, I am interested in Nike Outdoor Nationals because it would be a great experience and I have never competed at that level before. The closest was when I competed in Golden West in Sacramento, CA. It is very important for me to qualify for the World Youth Meet because I want to be recognized by everyone in track and field for what I have done and what I am planning on doing. 6) You had a great rivalry, it seems, with Lanie Whittaker last year and have had some battles with Robin Reynolds this year. Can you talk about these athletes and how having this kind of Florida competition to push you has helped? I'm close friends with Lanie Whitaker. We talk often through text and have developed a great friendship, beyond my thoughts. Robin Reynolds, on the other hand, I just recently had a chance to talk with her face-to-face at a few meets and she appears to be real cool. I love the competition that we have amongst each other. I truly love the competition because it allows me to run faster and it boosts my ranking in the nation. That is what I love the most and it drives me towards my goal. 7) I’ve been told you have the nickname “Eutsey Effect” … can you tell us the story behind that? One of my teammates – Sharnice Byrd, our pole vaulter – gave me that nickname. On my birthday, May 3rd (which was the same day as the state championships last year, 2008), she told me that I have a "Eutsey Effect" on the competition. Its’ some special effect I have against my competition when I running against them. If I am behind them, they know I am coming to get them and if I am ahead of them, I will stay there and most likely create a gap between us that they will not be able to close. It was so cool, so I used it and placed them on my socks. 8) Can you tell us a little about your family? Have your parents and siblings been strong supporters of you and inspirations for you in track? I understand you have eight brothers and sisters. Have others been active in track or other sports at Southridge or have you really been the main athlete in your family? All of my siblings have speed, but never ran track as intensely as I have. They all tried out but never stuck with it. My whole family really supports me; they tell me all the time to stay focused and don't let anything get in your way. My sister, Kenya Miller, was actually the person who pushed me in 9th grade to keep running, when I didn't want to because it was getting too hard for me. She encouraged me with her words and stayed on me. My brother, Tremaine, has been active in sports at Southridge. He ran track and played basketball.